It’s Christmas Eve and none of the children want to go to bed. ‘Please tell us a story!’ they beg. What follows is a simple telling of the Nativity story through songs (which have plenty of actions). The Nativity is acted out during the songs, after each of which the children ask ‘What happened next?’ Mum and Dad take the story forward into the next song, and so it goes on, until it really is time for bed! We used 'Little Nativity' as a sing a long. It was incredibly easy to do without any rehearsal as we taught the songs as we went along. The toddler groups LOVED it. The parents really enjoyed a fresh look at the nativity story with their under 5s being adorable. Easy actions, no complicated rehearsals, fitted in to a very accessible time frame for the under 5s. Cannot recommend this highly enough for toddler groups, nurserys and preschools. The performance went really well. Everyone commented how brilliant those songs are... the children LOVED it. Just wanted you to know that "A Little Nativity" & "A Wriggly Nativity" were both a tremendous success at Westdene Primary this Christmas!! Thank you so much for writing engaging, enjoyable & stress free nativities for KS1 children - they loved it, as did all the staff & parents too! 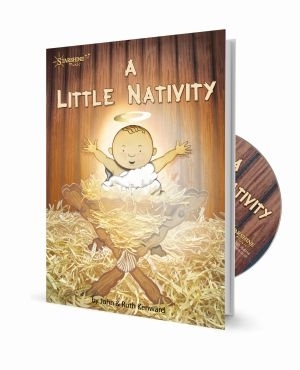 Having been involved in the directing and producing infant Nativties for MANY years , I can honestly say that "A Little Nativity" is a work of genius!! The music and script "tick all the right boxes" and the children, from Pr1-3, LOVED performing it! I only had to play a song twice before everyone knew it. Even the older children having watched the performance were walking around singing the songs -unbelievable! I didn't think you could do anything better than "A Wriggly Nativity" but I stand corrected - Well done to the writers and many thanks! This is a fantastic production! We have been able to learn the songs and put the whole performance together in less than two weeks. The children love the songs (as do the staff!) I would certainly recommend this for anyone trying to stage an Early Years production. Absolutely brilliant! The children are still singing the songs weeks later as they loved them so much. How has this not been done before? So simple and yet poignant. I highly recommend 'A Little Nativity'.